An interesting mystery that goes in some strange and unpredictable directions as the script becomes more about character than plot. Homicide is not what you would expect. From the title, actors involved, and even the writer / director David Mamet, you expect something a little more conventional. Something more like the Spanish prisoner (Mamet’s best film), or heist, which are mysteries, but ones that movie in straightforward, linear directions. 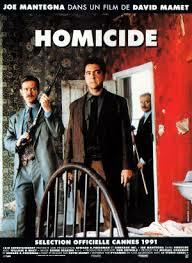 Homicide is a bit more complicated than that, not only in its narrative, but also in what Mamet is trying to do with the movie. This is probably his most personal film, and that’s all there, on the screen, for one to tell. 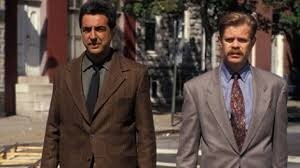 The movie is about a Jewish detective, Bobby (Joe Mantegna) who is called in to work on a huge FBI case involving a cop killer and brining the man in. at the start of the movie the swat team raids the house where they think the killer is. Then we get a meeting scene, in what seems like a school gymnasium, where the police and the FBI pull their heads together to discuss what ideas they have for how to catch this guy. Bobby suggest going through the family. He knows the guy’s brother and thinks he might be able to get that brother to help out. As he leaves the meeting and walks down the fall, an FBI man starts to call Bobby out. He doesn’t like Bobby’s confidence or arrogance, or maybe he doesn’t like his idea. He calls Bobby a Jewish slur and it isn’t Bobby who sticks up for him as much as it is his partner, Sullivan (William H. Macy) who is ready to fight over the racist words. Sullivan defends Bobby and needs to be held back, saying, “you can’t talk to my partner that way, do you know what this man has done?” what’s interesting to note about all of this is that it’s not Bobby who gets super upset by the racist slur, but Sullivan. Bobby either doesn’t care, or else he’s used to it. All of that will become the focus of the movie later on and these opening scenes are foreshadowing where the plot will go. Well, now Bobby and Sullivan are driving down the street and they happen upon an empty police car next to abandoned building and officer standing behind the car holding his gun. They stop their car, get out and talk to the officer. At first, Bobby and Sullivan think there’s someone dangerous inside the building and pull his or her guns. Turns out it’s just a wild dog. There’s humor in this scene as the rookie police officer doesn’t tell them right away that they are looking for a dog, but as Bobby goes into the building, deals with the dog, and then looks over the rest of the room, the real crime appears. There was a murder. An elderly woman has been shot. The woman was Jewish, and she worked here, at a candy store. As Bobby is casing the scene and talking to the officers who were there first, an elderly Jewish man who was the husband of this woman walks up with his daughter (Mamet regular Rebecca pigeon). The man recognizes that Bobby is Jewish and wants him to work the case. Bobby, of course is busy, on the other case about the cop killer who they are trying to bring in. but the old man speaks to the police commissioner and uses his clout and gets Bobby put on the case, simply because he’s Jewish. Bobby resents his religion even more because of this. But now he starts working the case. He goes back to the store and finds out what the old woman was involved in. he goes to the woman’s house and finds a mysterious word written on a scrap of paper on the floor. He starts to trace that word, speaking to an elderly Jewish shop owner and then going to a Jewish heritage library. He approaches an elderly man studying the bible and the man speaks to him about the Jewish star and how it is two triangles, one pointing to heaven and the other pointing down to the earth. He talks of how the star on Bobby’s badge has points that aren’t aimed at anything. The discussion about the difference between the star on Bobby’s badge and the Jewish star represents the central conflict that is going on inside of Bobby. Is he a police officer or is he a Jew? Where does his loyalties lie? He can certainly be both of them, but sooner or later he’s going to have to choose one more than the other. All of this is foreshadowing for what’s to come. The library scene gets real mysterious when this old man asks Bobby to put a book back on the shelf for him and the spot where the book was in enables Bobby to see the library man discussing the information Bobby requested with another employee. And the two men are trying to cover it up. But Bobby oversees and hears them and hears them talk about a building known as the 212. Bobby goes to the building and finds an underground Zionist organization that wants something from him. There was a list of Jewish names that Bobby found at the candy store and even though Bobby has already logged the list into evidence, these men of this underground organization (led by the great Ricky Jay), want Bobby to bring the list to them. This is the first test of where his loyalty is. Another one comes when he helps out the organization by breaking into the model train store of a man who is a suspected Nazi. Bobby looks around the store and the more Nazi symbolism he sees, the angrier he gets. When he sees a Nazi flag, it is just a symbol. Bad, yes, but not enough to drive him over the edge. When he sees a certain horrific photograph turned into a poster, things change. Suddenly Bobby knows where his loyalty lies and what he has to do. His choices not only impact how he feels about himself as a Jew, but also how he feels about the rest of the people on the police force. At the same time that he’s in this model train store, the rest of his police team are breaking into the home of that cop killer and trying to bring him down. Bobby was supposed to be there with them. This movie has so much going on. Layer upon layer. For one thing, it is about a man caught in between two cases, and not just one. And each of the cases represents a different part of his personality. There’s the cop killer case and then there’s the Jew killer case. When he goes after the cop killer, he’s with his cop buddies, trying to bring this guy down. When he goes after the Jew killer, he ends up getting involved with an underground Jewish organization and learning more about his own heritage. This movie is a lot better than pi, another movie that tried to use the mysteries of Judaism and the torah to represent a much bigger conspiracy. In that movie, it was just confusing. Here, it all makes absolute sense. Men on the force have put Bobby down his whole life for being a Jew. Because of that, it has forced him to kind of regret being Jewish. That’s where he is at the start of the film. But as he gets more and more involved and sees more horrific things that have been done to his people, his feelings change. This is a wonderful movie that straddles the line between police thriller and heritage uncovering mystery. It’s not neatly wrapped and certainly not a conventional or mainstream movie, but that’s a good thing. This movie is far deeper and smarter than the average mystery and it really gets down and dirties into this character and what he discovers about himself.